Genie’s Gems is an online slot game that was developed by Microgaming. The online slot game is styled around Microgaming’s more classic type of online slot with the focus being more on spinning high paying winning combinations and less on side bonus games and other bonus features. There are no bonus features at all in the game or any bonus symbols like scatter symbols and wild symbols. Genie’s Gems does however, unlike most online slot games, allow winning combinations to run from both the furthest left reel and from the right direction. The jackpot prize is also much higher that most online slots and the reels have considerably less symbols which may increase the odds of landing winning combinations. Genie’s Gem is a five reel online slot with only five pay lines. One coin can be placed on each of the pay lines with varying values ranging from 0.25 up to 5.00. All of the main function buttons are displayed below the reels including the max bet button which allows the maximum bet to be placed with just one click. There is also an auto play function which allows the number of spins to spin automatically, the stop settings and the time delay between each spin to be adjusted to a predetermined setting. All winning combinations must have landed on an active pay line in order to pay out. All pay lines run from either the furthest left reel or from the furthest right reel. The online slot game has over 25 different winning possibilities. All winning combinations are paid out directly after they land and they pay out amounts according to the slot game’s pay table. If no winning combination lands after a spin, a new bet may be placed for a new game to begin. Genie’s Gems online slot game is themed around an Arabian night’s tale with magic flying carpets, genies and mystical lamps. Some of the graphics are animated and show smoke billowing from the lamps, the carpet flying across the sky, stars twinkling above the palace and when a winning combination lands on the reels the genie himself appears and laughs in victory. Throughout the game the background sound effects play Arabian themed music which is enhanced when a winning combination lands and the animated genie comes out to celebrate in animation. The ten; jack; queen; king and ace paying card icons can be found on the reels. These make up the lower valued slot symbols while the themed symbols are worth higher pay outs. The themed symbols include the genie himself; a magic lamp; a magic flying carpet; a palace and the Genie’s Gems. 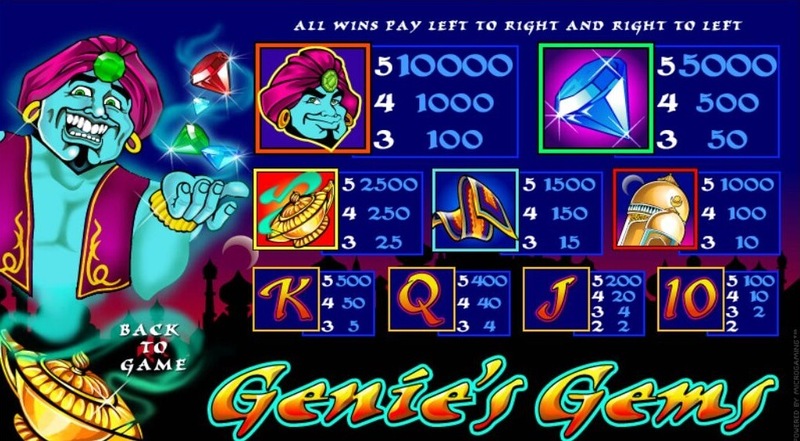 The genie is the symbol that pays out the highest jackpot prize of 10 000 coins when five land on an active pay line. The second highest prize is awarded for five of the Genie’s Gems symbols and 5 000 coins are paid out. Thirdly 2 500 coins can be won for five of the magic lamp symbols. Find this awesome slot game at your leading online casino NZ has to offer today, and make sure you have tons of fun when you’re playing!